Authentic Art Deco wares dating to the 1920s and ‘30s are highly valued in today's collectibles marketplace, and stylish decorators love them, too. Unfortunately, that is one of the reasons the terms “Art Deco” and “Deco” are so widely used, even when that’s not an appropriate descriptor. If you're in the market for Art Deco collectibles and wares you'll need a good understanding of what Art Deco is—and what it isn't. First, in today’s marketplace where the term Deco is thrown about with abandon, it is good to know how to identify true Art Deco pieces to protect yourself from buying something that isn’t what a seller purports it to be. Some sellers put Art Deco or Deco in their descriptions to draw more attention to them, which also serves as an indicator that they may be either inexperienced or a bit dishonest in their dealings. Either way, education will help to protect you from making costly buying mistakes. This valuable knowledge may assist you to recognize a true Deco “sleeper” at some point as well. If you happen to be a seller or aspire to a “career” dealing in antiques and collectibles some day, describing the items you sell correctly will take you further in the long run. Buyers will trust your assessments and patronize your business repeatedly as you continue to earn their respect. Art Deco is a design style which was influenced by earlier styles including Art Nouveau, the Bauhaus, and Cubism, and drew on decorative concepts from American Indian, Egyptian, and classical sources. Many Art Deco pieces use motifs from nature: nudes, animals, trees, and sun rays. Most Art Deco pieces are symmetrical; in many instances, you can imagine dividing an Art Deco piece down the center and the halves will be mirror images. Emile-Jacques Ruhlmann made furniture that fits into this category, and this master designer is are said to have introduced the world to Art Deco. This isn’t always the case, however. Some Deco items have bold geometric shapes that define them, like the fabrics designed by Sonia Delaunay used in textiles and clothing during the 1920s. 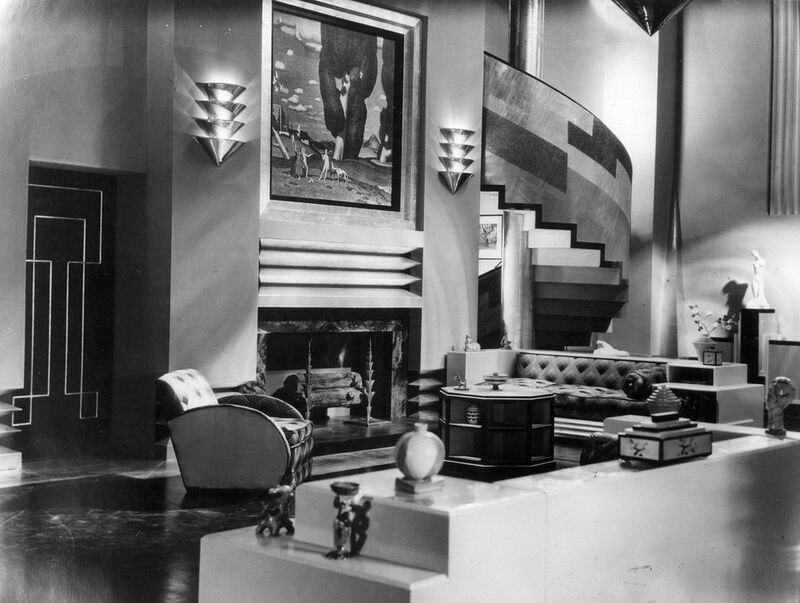 Angular lines, zigzags, and pyramid shapes were all popular in Art Deco design. Other motifs reflecting exotic cultures were incorporated into some Deco styles such as Greco-Roman, Egyptian and Asian, along with Jazz-age symbolism. Exhibited in items from clocks to jewelry, images like the familiar flapper walking a sleekly-lined dog come into play here, as well as those indicating speed like airplanes or trains. In some cases, the architecture of this era carried over to furnishings (like those illustrated in the magnificent photo above showing a complete room). The Chrysler Building and Rockefeller Center, both classic New York City skyscrapers, are examples of Art Deco style. Even the straight lines of drop waist dresses popular during the 1920s are typically angular and exhibit Deco style. Popular styles and imagery have always been copied, and Art Deco designs are no exception. Every so often artists and designers are inspired by the past to create new items in homage, and they usually have a bit of a modern twist to distinguish them. These are considered to be revivals of older styles rather than reproductions. For instance, a piece of jewelry or furniture with Deco influence made during the 1980s would be a revival piece although it looks much like an original. If the items being newly made are exact copies of old pieces, they would, of course, be put in the reproduction category. Jewelry is one area where Art Deco styles are perennially popular, but revivals reach into all areas of decorative arts. To distinguish old from new, look at the materials used and the construction of the item. Some modern materials and components were not yet available in the 1920s and '30s. Craftsmanship can also be a clue, so looking at manufacturing details will also help to distinguish true Deco from Deco Revival pieces. The term Art Deco wasn’t actually coined until the 1960s, so the term Style Moderne was used in the years leading up to the 1920s. There is a great deal of similarity between these two styles, and some sources state that they are identical. In some cases, Art Moderne pieces, sometimes called American Moderne, are bigger and bolder than Deco pieces; many are teardrop or torpedo-shaped. What's the Difference Between Art Deco and Art Moderne?